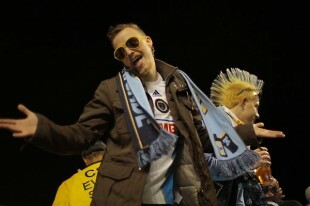 EDITOR’S NOTE: Here’s the next in PSP’s series of fan posts, with Union fan Seth Finck dreaming up alternatives to the Union’s MLS malaise. As I sit and watch the Union “play” another game as if it’s their first and Bob Rigby confuses Zac MacMath for Zack Morris, I cannot help but think of how much I’d rather watch this team do just about anything than continue playing soccer at their current clip. I’ve played soccer for most of my life, but I can’t recall watching players run about the pitch so disorganized and unkempt as the Union have been. Even seven-year-old youth games have organization. Sure it’s a cluster, but it makes more sense than the unbalanced, inadequate attack we’ve been seeing. Peter can play older Biff Tannen, Brian Carroll makes an ideal Marty McFly and Porfirio Lopez has the locks to take care of Doc Brown. And even bring the Bimbo Bear as Doc’s dog, Einstein. Use the team’s international make-up to provide us with a book full of recipes from around the globe. Kai Herdling can bring us some wursts, I’m sure Gaby Gomez could show us a thing or two about Panamanian food, and Danny Mwanga could take us on a safari of Congolese cuisine. Since we’ve only been able to sing it eight times this season, I’ve really missed that victorious refrain. Someone on that team has to have pipes and to be honest for DOOP, you don’t even need ‘em. Give the people what they want, give ‘em the DOOP! Remember elementary school Field Days? It would be nice to see the joy of those lucky youths on the grimacing faces of Zac MacMath, Carlos Valdes, and Sheanon Williams. They just don’t appear to be having any fun, and what’s better than a water balloon toss, balloon-pop relay, or an obstacle course? I feel like this could be the team-building diversion they need! Far be it from me to say I understand the dynamics of a professional locker room, but I think that tensions might be running a little high for the team. And in any situation when things are not going as they seem, people turn on their leader. It could be really constructive to poke fun at the boss man. As long as he’s willing to take a joke, which remains to be seen. I kid. Well, I mostly kid. It’s just a hard to swallow the fact that the U-N-I-O-N may be D-O-N-E this season after only 11 games. They’ve had two stretches of passable play, nothing resembling the steady play that landed them the long win-streaks of last season. That being said, it’s time for our players to stand up, fight that pill off, and play with the passion that brought us to the playoffs last year. We could stand around and wait for Danny and Sebastien to come back, we can pine for the glory days, or we can start a petition to have the team compete in Field Day. I choose the latter. But for now, C’MON THE U! The season starts now. I agree a petition is in order or at least something resembling that to call for some accountability from the FO and the managerial/coaching staff for what amounts to a complete dismantling of an exciting if not talented team. Field day could be entertaining however.